The Underground Resistance may well be the best record from these guys in quite a few years, as each of its six songs are brimming with youthful energy not typically found from a band who have denim jackets older than most metal fans. 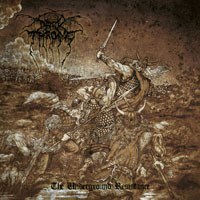 The Underground Resistance is a fitting title for a Darkthrone record. The Norwegian pairing of Fenriz and Nocturno Culto have played an enormous part in leading the underground metal resistance, and their lifelong passion for metal has resulted in Darkthrone releasing records that have touched upon numerous sub-genres and pioneered others. From death metal beginnings to their hugely influential black metal period and onward to their recent crust-punk fixation, Darkthrone have been forerunning trends and blazing their own uncompromising path for 27 years. The music that Fenriz and Nocturno Culto have made under the Darkthrone black flag has been entirely self-centred. The band have pandered to no one and have changed artistic direction at will, yet with each progression/retrogression the music has remained consistently impressive. The Underground Resistance may well be the best record from these guys in quite a few years, as each of its six songs are brimming with youthful energy not typically found from a band who have denim jackets older than most metal fans. The kind of heavy metal that Darkthrone have created here does not age, and claims could be made that the metal of the traditional variety has never been as popular as it is now. There's a plethora of young pups making records blatantly influenced by metal’s figureheads: Judas Priest, Motorhead, Celtic Frost, Mercyful Fate, Manilla Road etc. However, unlike some of the younger groups, Darkthrone continue to hit the essence of their influences squarely on the head without sounding contrived or flagrant with their flattery. And as with every one of their records, The Underground Resistance ends up sounding decidedly Darkthrone. A large part of the band’s history has been the lo-fi nature of each recording. This is borne out of a need to control the production of each record internally rather than any aesthetic preference -- something that plenty of isolationist black metal “artists” have misconstrued while taping in their parents basements through a four-track caked with dirt. That’s why it comes as a welcome surprise that The Underground Resistance houses the punchiest production of Darkthrone’s extensive discography. The musicianship is given a definite audible clout and the talent of this dastardly duo have never been as easier to heed. And heed you will once the 13-plus minutes of sonic mauradery that is “Leave No Cross Unturned” draws this record to an exhausted halt. It's a lengthy jaunt which touches upon the grandiose vocal gymnastics of King Diamond galloping upon hellbound ‘80s-inspired thrash metal riffs, before descending into the Crypts of Rays with a spiteful Celtic Frost groove and Warrior-esque vocal grunts recalling “Dethroned Emperor” off 1984’s Morbid Tales, and flitting between variations of these two disparate sections until the end. It's a highly derivative yet completely satisfying conclusion to Darkthrone’s 15th LP and may even be worth the asking price alone but what makes The Underground Resistance a victory is that the other five songs arguably compete for attention riff by unruly riff. “Valkyrie” imparts the pagan charms of folk metal, while “Dead Early” and “Lesser Man” are prototypical Darkthrone: all callous vocals and ‘80s metal traditions. “The Ones You Left Behind” bucks like early Motorhead with more than a hint of Voivod’s Snake slithering into the vocal phrasing, and further in, Darkthrone inject some welcome melody into the hurtling NWOBHM riffs. Each of these songs are kept expectedly succinct, relying sternly on the bare essentials, with only “Come Warface, Entire Doom” -- a song which rumbles through various tempos yet stays doom -- and “Leave No Cross Unturned” stretching past the five-minute mark and making up for almost half the record’s running time. Because of this, The Underground Resistance is for the most part, reined in, punk in its attitude and altogether hungry sounding. To remain relevant three decades later is quite exceptional, yet these two elder-statesmen of extreme metal continue to defy logic and carry on with their middle fingers raised to conformity and opinion.